If you haven’t heard of Devnaa chocolates yet, you are just about to. Founded in 2006, Devnaa is a sister and brother team based in London. Roopa and Jay Rawal have taken a modern approach to traditional Indian sweets and produce a range of Indian-inspired chocolates and confectionary. With their distinctive Indian flavours, these are for the more adventurous palate, but if you like the combination of chocolate and spices, these are for you. I happen to be a fan of this combination and was recently sent their signature box to review along with a signed copy of their recently published cookbook, Indian-Inspired Desserts by Roopa Rawal. I also have the same set to offer as a giveaway. Immediately, the vibrant packaging alerts you to the fact that this is not your average box of chocolates. Lime green, fushia pink, purple and gold all combine together to create a thoroughly exotic feast for the eyes and transports you from grey old Blighty to a place where the sun shines with more intensity and regularity. With my penchant for bright colours, I am in love with their boxes. The box is also cleverly designed to look like a tiffin tin, the standard lunch box used in India. The Devnaa logo, a distinctive gold tear drop, appears in all sorts of forms. In my experience, Indians generally have a very sweet tooth, so I was pleasantly surprised to find these chocolates, although sweeter than I would prefer, are not overly sugared. The box contained sixteen chocolates, two of each flavour and they were a good mixture of chocolate, fillings, textures and flavours. Chai Masala Caramel – This was the one I made a beeline for. I love chai masala and I love caramel. The caramel was delicious, salted and with a good chai flavour, but without being overpowering. The milk chocolate shell was thick and I would have preferred a higher ratio of caramel to chocolate, but I still wouldn’t hesitate in consuming an entire box of them. CT agreed on how delicious they were, but liked the thick shell which cracks satisfyingly in the mouth. These have won a Gold in the Great Taste Awards and if they hadn’t they would certainly get a gold from me. Rose and Ginger Cream – Enrobed with a thick plain chocolate shell which worked well to take the edge off the sweet rose cream. The rose makes an immediate impact, evoking exotic locations. Later, a subtle warming taste of ginger comes through and lingers nicely on the palate. Being a big fan of rose, I found this to be delicious, if a trifle sweet. Saffron and Ginger Fudge – I was expecting the ginger to take centre stage on this one as ginger pieces are contained within, but it was the saffron that dominated. I found this interesting, but it didn’t have me running back for seconds. Strange as I like saffron cake, which is a Cornish speciality. Covered in a thin skin of milk chocolate. Almond and Orange Praline – A very nice nutty praline which has a slight crunch to the texture and is delicately flavoured with orange. Covered in a thin skin of milk chocolate, it was delicious. It reminded CT of a peshwari naan, but in a good way. He has a bit of a thing about overly strong orange flavours, but thought this was very nicely balanced and would have eaten several, given the chance. Honey and Cardamom Fudge – Covered in a thin shell of dark chocolate, this has a powerful and persistent taste of cardamom. The more delicate flavour of honey comes through after the initial spicy surprise. I found the dark chocolate a little too bitter, the cardamom needed toning down a bit and milk chocolate might have been a better choice. CT, however found them invigorating and enjoyed the experience. Saffron and Pistachio Caramel – Covered in a thick white chocolate shell with a nice vanilla flavour, the saffron was once again the dominant flavour. Although the pistachios added a nice crunch, the flavour was rather lost. The caramel was just the right consistency, liquid but not runny. I find the flavour of saffron rather overwhelming and a bitter aftertaste persisted on my palate. It also left a dry sensation and would probably be better taken with a nice cup of tea. Again, I found this one to be interesting, but not one I would pick out for preference. Cinnamon Praline – As a cinnamon and praline lover, I was looking forward to trying this one and I was not disappointed. This has a good cinnamon flavour, but is not too strong. It has crunchy pieces of crisped rice within a smooth hazelnut praline and is enrobed in a thin layer of milk chocolate. Both CT and I thought this was delicious. Coconut and Cardamom Caramel – Another thick dark chocolate shell with a distinctive bitter note which works really well with the sweet but delicious caramel filling. The caramel has a delicate but distinctive flavour of coconut with a persistent note of cardamom. As soon as I heard that Roopa had published a book, I was keen to have a look at it. Indian sweets are deeply reminiscent of my student days up in the big and exciting cosmopolitan world of London where I indulged in them with, err, more than seemly regularity. That together with my mother’s love of curries have given me a passion for the exotic flavours of India. Indian-Inspired Desserts is a lovely collection of exotic egg free cakes, biscuits, sweets, traditional and fusion desserts, drinks and frozen desserts. I’m not a Sanskrit scholar, but the name Devnaa may well have a similar meaning to our Divine, which is certainly how I would describe this book. The book is beautifully presented with Indian inspired motifs and colourful pages. The cover is a distinctive saffron yellow and is a good solid hardback. Unusually for modern cookbooks, there is an illustration for each recipe, giving a good idea of what you are aiming to achieve. The book starts with a section on key ingredients and includes some useful information about each one. I for one didn’t realise that eggs are often not used by some groups in India due to cultural and religious sensibilities. Caution is given about using good quality spices, especially when it comes to saffron. Recipes for three basic building blocks are included at the beginning: Devnaa’s signature chai masala, an egg-free sponge and paneer, a fresh curd cheese which I find particularly delicious. I couldn’t wait to try something out and no sooner had I received the book than I was knocking up my first ever barfi. I was thrilled with the result and served it up at a dinner party the next day. I am looking forward to trying out more of these recipes with pistachio and coconut biscuits being next on my list. Other recipes I’m keen to try include: chocolate seera, apricot and saffron scones, white chocolate kheer, carrot halwa and a mixed nut and chocolate brittle (chikki). Further recipes can be found on the Devnaa blog. I was sent a copy of the book and a box of chocolates for review purposes and as always, any opinions expressed are all my own, unless stated otherwise. To have your chance of winning a signature box of Devnaa chocolates together with their cookbook, Indian-Inspired Desserts, please complete the Rafflecopter below. You will need to leave a comment on this post which then gives you additional chances to enter if you so wish. Rafflecopter will pick a winner at random from the entries received. If you are commenting anonymously, please give me some way of identifying you as I will be verifying the validity of entries. Any automated entries will be disqualified. This giveaway is only open to those with a UK postal address. I haven’t tried Indian sweets since I was a lot younger – I wasn’t a fan then, but my tastebuds may have improved since!I think my favourite spice to go with is cayenne pepper – a little bit fiery but still tastes good. I think cinnamon would be interesting! 2nd attempt at a comment! I would go for the same ones as you – Chai Masala Caramel and Cinnamon Praline, they both sound amazing! I think that cinnamon is great with chocolate. Cardamom is my favourite spice to pair with chocolate. Cinnamon – it’s my favourite spice so I think that would be my favourite. You have piqued my interest in Indian desserts, chocolate and almonds for me. These all sound so unusual – I’d love to try the coconut and cardamom, but I think I would like them all! Oh these chocolates look divine. Such perfect little bites of heaven and beautifully packaged. As for a spice that I think would go well with chocolate. I’m the first to mention this but star anise? Either that or I’m game for ginger or cinnamon. Ginger is lovely and so is chilli. Chilli is lovely in chocolate. Has to be mint, lovely! They sound delicious – I am such a sucker for ginger. 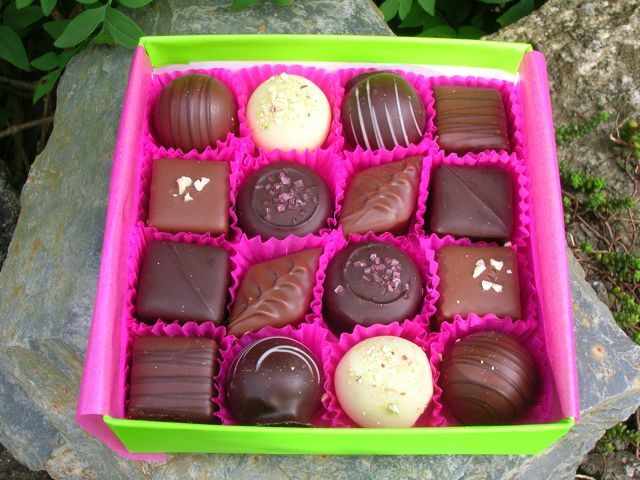 Some of the chocolates look like they’ve bloomed a little – was it nice quality chocolate? I love the flavour of cardamom and chocolate. I absolutely love chili and chocolate. Cinnamon goes really well with chocolate. I think Ginger is gorgeous with dark chocolates! If cinnamon counts then cinnamon definitely. Sounds weird but wasabi is amazing with chocolate! chilli and chocolate always go really well together. I think ginger – or possibly chili. Has to be chilli. I always add dark chocolate to my chilli con carne. For me it has to be ginger. Oooo, definitely chilli, have tried chilli chocolate & it’s amazing! Always wanted to try Nutmeg. I imagine cinnamon would taste well with chocolate. I think ginger is a great spice with chocolate! One of the best spices that combines well with chocolate is chilli. Cinnamon! Absolutely gorgeous with chocolate. I think nutmeg is a good one! I’d definitely say nutmeg 🙂 yummy! Ginger and chocolate is the only way. It has to be ginger. I am a huge chilli and chocolate fan – I don’t think anything else comes close! Alwyas chilli or perhaps cayenne pepper for me! I think Ginger and chocolate are the perfect pair. Cinnamon & choccy – yum!